The most common surfaces of the shoe used for kicking in Footbag net are the inside and outside surfaces. The sole of the shoe is also frequently used, however, only when performing a standing or flying spiking maneuver. Due to the large amount of court a player is responsible for covering, it is extremely important to have a good foundation of kicks with both the left and right legs. Outside kicks are generally thought to be the most important kick in net, as they are used to receive serves and to set oneself or one’s teammate. 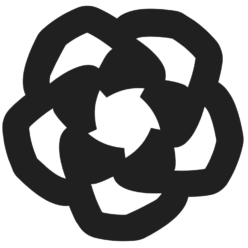 Toe kicks are most frequently used when the footbag is falling in front of one’s body. Inside kicks are frequently used to receive serve, to bump or set a teammate, or to direct a kick across the net. Inside kicks are also the predominant kick used for serving, however, many players also use toe kicks. Out side kick serves are uncommon but can be effective. 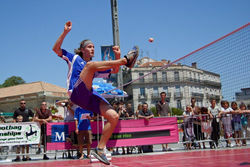 A spike is defined as kicking the footbag over the net with a downward trajectory. Spikes can be performed while standing (i.e., one foot remains on the ground while kicking) or while jumping or “flying” (i.e., both feet are in the air while kicking). While they are more difficult to learn, flying spikes are more advantagous to learn because they allow for a greater margin of footbag clearance over the 5-foot-high net. On the net court, you’re likely to hear some words and phrases that you’re unfamiliar with. While most of these terms are used in all net-playing countries, a few terms vary by region. Click here for a glossary of Footbag net terminology.